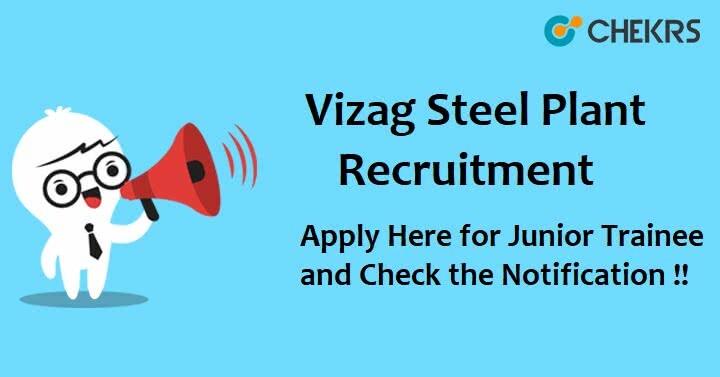 Vizag Steel Plant Recruitment 2018: Rashtriya Ispat Nigam Limited (RINL) is the corporate entity of Visakhapatnam Steel Plant (VSP), invites young, dynamic talented individuals to join as “Junior Trainees” in the different branches of Vizag Steel Plant. The RINL Vizag Junior Trainee Vacancy 2018 Notification has been issued by the recruiting authorities on the official website. Candidates, who are interested to in these Government Jobs, can apply for them before 25-09-2018. Candidates must check their eligibility before applying for the VSP Steel Plant JT Vacancy. Follow the given guidelines to register yourself for the available posts. Log on to the official website of Vizag Steel. Go to the tab “Careers” and click on it. Go to the registration link to complete your one time registration. Note down your registration number and password. Fill up the Vizag Steel Junior Trainee Application Form. Upload digital photo & signature. Print the e-receipt and submit the form. Collect the registration slip and application form printout. Remarks: We will be happy to clarify your doubts and issues, if any, regarding the Vizag Steel Plant Recruitment 2018. Leave your queries in the commenting section so that we can respond you as soon as possible.